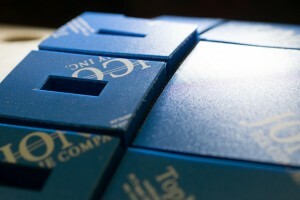 TopMatrix™ | Jonco Die Company Inc. The Patented TopMatrix™ System is an innovation to conventional die cutting. Applied to both flat bed and rotary cutting dies, it improves the cutting/creasing forces resulting in a superior die cutting performance. The TopMatrix™ is composed of a matrix sheet affixed to the surface of the cutting die in sections or as full coverage. Powerful ejection device that reduces cracking by eliminating pressure points. A closer to the cutting/creasing rules reduces perimeter cracking as well as cutting dust or “angel hair”. Rougher anvil surface will carry the waste material away from the product.